Mummies and Masterpieces is proud to offer programs to Jewish schools and organizations. From parent/tot visual arts classes to intergenerational experiences and everything in between, we work with all ages and all denominations. 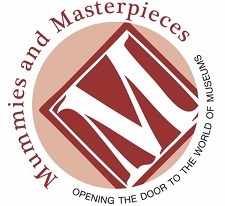 Mummies and Masterpieces brings you almost 25 years of experience in integrating worldwide museum collections with Judaic themes. Why choose Mummies and Masterpieces? We understand and respect the diverse backgrounds of the communities in which we work. Sensitivity is always utilized in order to develop the most appropriate and meaningful programs for each institution. Our Founder/Director attended Yeshiva of Flatbush, Hebrew Academy of the Five Towns and Rockaways, Stern College for Women, Hebrew University of Jerusalem’s Rothberg School for Overseas Students and Melton Centre for Jewish Education She has worked on the staff of The Metropolotan Museum of Art , The Abraham Joshua Heschel School, and Solomon Schechter Day School of Metropolitan Chicago. She has also developed and taught programming for a local reform congregation, creating visual and hands-on Bible programs for 3rd and 4th grade students. This included researching and recreating with the children the Priestly Garb, the Levite’s ancient musical instruments, the Tabernacle, the Knesset Menorah and much more. Children need to learn through multi modalities in order for their lessons to have the most impact. Mummies and Masterpieces validates, supports and celebrates the individuality of each student. We understand that all children absorb, process, and express ideas in many different ways. Our goal is to bring exciting and meaningful Bible, History and Hebrew language lessons to all Jewish students! Registration is going on now for our Chicago area Journeys in Judaism enrichment program. This program takes place at Mummies and Masterpieces on the campus of North Shore Congregation Israel in Glencoe, IL. Similar programs are also available in the Orlando area. Please contact our Orlando Regional Manager, Julia.Berger@MummiesAndMasterpieces.com for more information.